The Oshawa Naval Veterans Club has recently (December 2011) received a very generous gift in the form of a modular building for the Navy Club's outdoor storage needs. The shed has been provided to us by a company owned by Harold Cottom called New Building Solutions. The Oshawa Naval Veterans Club would like to sincerely thank Harold for his gracious offer. 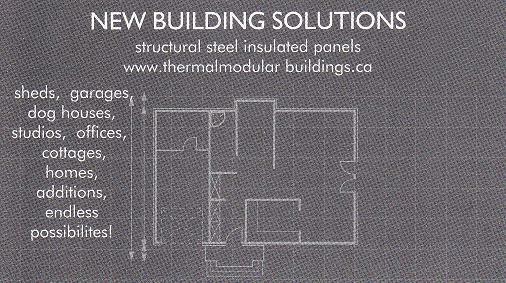 The Club would also encourage all who may need new upgraded thermal modular buildings for their outdoor storage needs to visit the New Business Solutions website at www.thermalmodularbuildings.ca or in person at 3-31 Cold Storage Road, Picton, Ontario, K0K 2T0 or call Harold Cottom at (613) 476-2300, you may leave him a message anytime! You may also e-mail Harold at harold.cottom@gmail.com, or come on down to view the shed itself at the Club and pick up one of their flyers and/or business cards. Want to see pictures of the shed's construction? Click here! to get to the photo album. Thank you once again Harold for your gift, we will put it to good use. 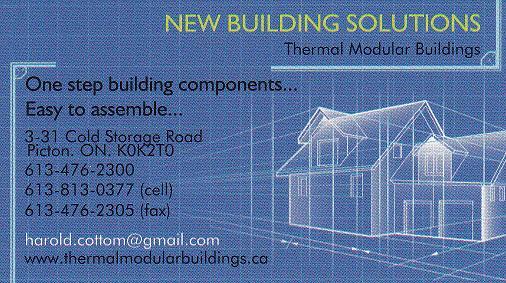 Please take a moment to scroll down this page to view their flyer and business card.